The Mary Pappert School of Music prides itself on its excellent students and faculty. From performance to academics, our school is comprised of the finest musicians. To receive these news stories weekly, subscribe to our email newsletter. 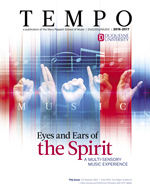 The Mary Pappert School of Music also publishes an annual magazine called TEMPO, highlighting our students, alumni, faculty, and staff. If you would like to receive a printed copy of the most recent issue of TEMPO, please send your mailing address to tempo@duq.edu. To see an archive of all issues of TEMPO to date, please click here.